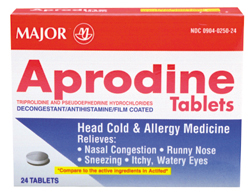 Due to Federal Regulations on pseudoephedrine there is a limit of two (2) packages per household per transaction. Also, you may not purchase more than five (5) packages per 30 day period. * We will only ship to the address shown on your photo ID unless you provide additional documentation. Provide address that appears on your Photo ID. If your U.S. state is not listed, we cannot ship there. Items usually ship 1-3 days after order placed. We will only ship to the address that is shown on your Photo ID unless you provide additional documentation (e.g. copy of a paper Utility Bill that clearly shows your name and address). When we process your credit card we use AVS technology to verify your address.